Peak Tone 9 holds the Intention of Patience to see the bigger picture. Tone 9 warns there could be suffering if we fail to look deeper into the Truth of what we Know. Tone 9 is all about completion of a new perspective. Tone 9 Offers a Spiritual Tool. Divine Inspiration is something we were meant to think about. Our gift of Free Will, means we aren’t told what to do. We’re intended to make a Divine Choice. The Creator inspires Human to Create its own Experience. Choice is our Gift of Divinity. By Choice we can create anything that is aligned with a purpose of the Harmony and Equity of the Whole. On Tone 9 our Faith will be Transformed to a Belief. Deer/MANIK is the Day Sign of the Mayan priest and shaman. Human’s Divine Purpose is to Serve as the Hand of God. The glyph illustrates the Hand, another name for MANIK. The forefinger (direction) and thumb (will) are grasping a thread of Ether of Spirit. Hand completes a circuit to a Divine Source of Power. Deer/MANIK is also the Year Bearer. 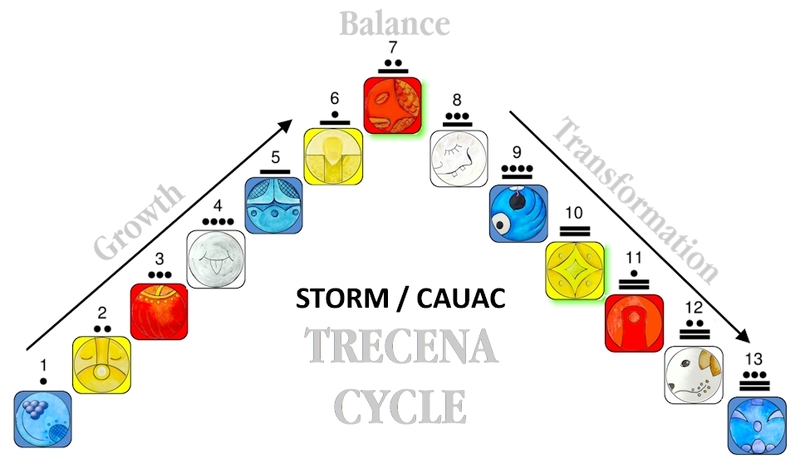 The Storm/CAUAC trecena is a gift of lightning energy for Renewal and Regeneration. Today, the Tzolk’in reflects a Major Life Change of Universal Intention. Deer/MANIK is the Day Sign of Spiritual Tools. The strength of the Deer lies in its Spiritual Tool of Vigilance. Deer protects the whole by standing silently in its own Truth. It defends the Whole through Vigilant Consciousness of the movements in every direction. The Deer holds the power of Harmonic Resonance. Deer’s movement in the strength of its purpose generates a vibration that others naturally follow. Holding a position of Unconditional Love, we can be reunited in Divinity. Deer/MANIK is said to keep every Spiritual Tool it has ever used. Deer knows every path that leads to our Divine Home with the Creator. Residing in the direction of the West, MANIK touches our emotions to bring light to our fear. For every limitation we are willing to see in our Self, MANIK will offer the Spiritual Tool that overcomes our fear. A Divine Intention that exceeds the limits of our Human Nature is the way Human can experience its own Divinity. The Creator made Human for the purpose of a Divine Relationship. Before the world was created, there was only the One Divine Consciousness. Everything that ever was and ever could be existed in a Static state of Being. We were created as Sparks of Divine Consciousness, first descendants of the Creator. Just like Human children, each one would reflect a different image of the One. Through Human, the Creator was offered a dynamic reflection of itself. Through us, the Creator could witness an image of its own Being – “Creator Loving,” “Creator Sharing,” and “Creator Forgiving,” an experience only possible through a Relationship. We are Holy in a choice to share our experience with the Creator. Tone 9 calls for the Time, Effort, and Courage to look within our Self to see where we are lacking. Only through the consciousness of our limitation, would we See the Light of Divinity. By knowing our limits, we can see where Human Power ends and Divine Power begins. Human was Chosen to be the Savior of Humanity. We were Chosen to Divinely Intervene under the Authority of the Creator. Our Mission is to Reunite all the Sparks of the Creator into the One Divine Consciousness of Unconditional Love. This trecena presented a steep climb. How could I create happiness, while those who ran for their lives had their families torn apart by the “Hope of their Salvation.” Their Divine Justice is more important than my happiness. Yet, I know my strength lies in Love. We draw Power from Love in every Expression. Looking deeper, I can Love every Voice of Love I hear, and every Movement motivated by an Intention of Love. I Choose to Believe in Love. We were given the Divine Mission to guide and protect the people, and to carry out the Divine Justice of the Creator. Our Spiritual Gifts were given for the purpose. We wield our Highest Power when our Movement is guided by Unconditional Love. To all my relations, may we see our Self through the eyes of the One Divine Consciousness. May we Acknowledge that Divinity was embedded in our Design and inherent to our Identity. May we draw all the Love we can from Mother Earth, remembering that every experience of Love is an Eternal Memory we share with the One. May we find our own way to share the Light of our Consciousness. May we Know that anything is possible when we Unite in a Choice for Unconditional Love. May we remember the children of the world in our prayers. I’m grateful for the Unlimited ways we can be empowered by Love. I just connected the dots: it is better for me to drop by daily at work to see what’s today’s card than to wait until weekend and read what was. It’s a nice way to set the day this way.